Joseph and Anne-Marie Sandler formed one of the greatest psychoanalytic partnerships in the history of the discipline. They have left an indelible mark on British and international psychoanalysis, yet curiously their legacy is rarely celebrated. 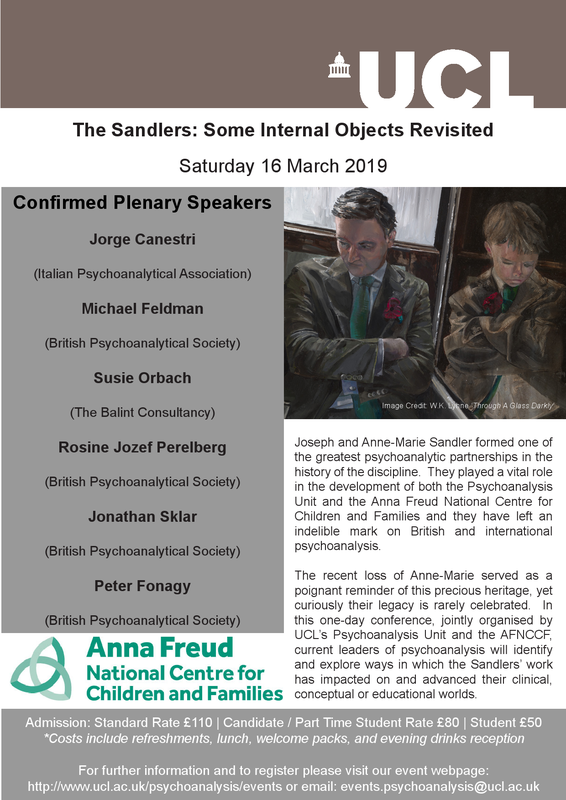 The recent loss of Anne-Marie served as a poignant reminder of this precious heritage, and of the vital roles the Sandlers played in the history of both the Psychoanalysis Unit and the Anna Freud Centre. Both these giants of psychoanalysis brought clarity to innumerable clinical conundrums, such as projective identification, countertransference, depression and the nature of the unconscious. Their ideas have remained vital to psychoanalytic work, and revisiting their unique vision of the mind and clinical practice can continue to support us in our efforts to assimilate and integrate new developments. In this one-day conference, current leaders of psychoanalysis will identify and explore ways in which the Sandlers have impacted on and advanced their clinical, conceptual or educational worlds.